Andrew J. Bevans prediction of the largest earthquake in Norway for 50 years to the exact date was first published in Romeriksposten Dec.30 1988. 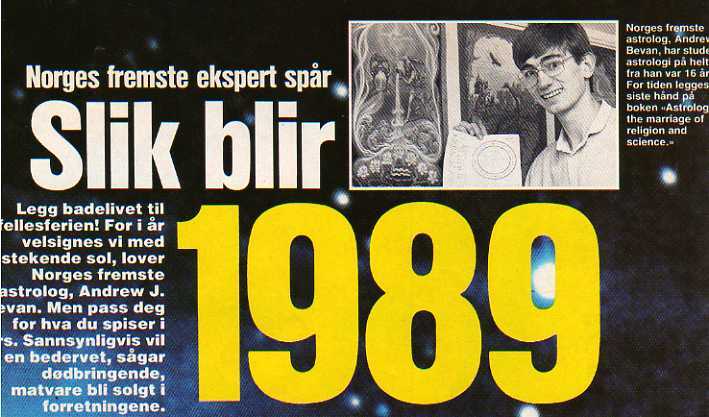 And also appeared in Billedbladet NÅ on Jan. 5.1989. The final warning of the quake appeared in Romerikspostens issue one week ahead of the quake. Norway was rocked by 3 significant quakes within one week around the forecast date. Quakes occured on the Norwegian West Coast. The largest one measured 5,3 on Richters Scale and occured on Jan. 23rd. No one was injured and damages were minimal.